Thursday, June 17, 1999 the Honolulu Advertiser, one of Oahu's biggest newspapers, covered a story about the impeachment of Big Island Mayor Steven Yamashiro. Roger Christie headed the impeachment proceedings by obtaining 100 signatures from registered voters. 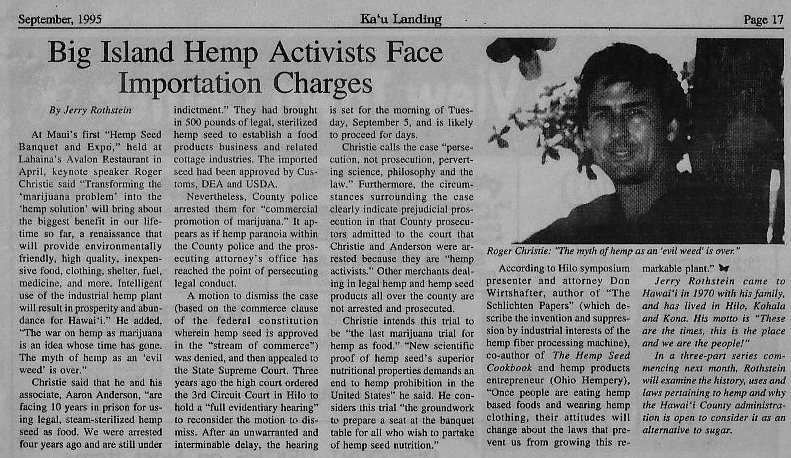 Roger Christie charged the Council with malfeasance because it didn't accurately pursue a policy review of it's "green harvest" raids by law enforcement. The State auditor refused to review it's "green harvest" program even after the council approved the review by the legislative auditors office. Council woman Bobby Jean Leithead-Todd of Hilo, suggested the proposed impeachment was unfounded. Leithead-Todd and her constituants support the police campaign against marijuana. "Most of them thank me for supporting the police," Leithead-Todd said. Roger Christies petition also stated "wrongful prosecution," referring to Christie and Arron Anderson's arrest for felony promotion of marijuana for importing sterile hemp seeds. Roger Christie's case was dismissed while Arron Anderson's case ended in a hung jury before being dismissed. Judge Susan Gerber found that deputy prosecutor Kay Iopa had presented false evidence that suggested the seeds had germinated when tested. Anderson filed a counter civil lawsuit against the State that was reinstated by a three judge panel.